A raised garden bed is a great way to create a unique, convenient gardening space in your own yard, but constructing one can be a time-consuming hassle! 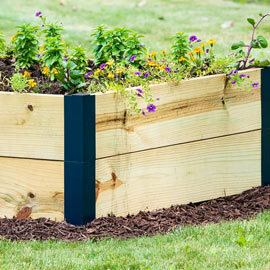 This time, take the stress out of building raised garden beds with these easy-to-use corners. Powder-coated aluminum stock means they're built to last and won't rust. Simply slide your lumber (not included) into place and use the provided screws to secure. The corners accept 10"-wide boards and create beds up to 8' long. Each set includes 2 corner connectors, 2 corner caps, and 8 1.25" Phillips screws. 1 set includes two corners, so 2 sets are required per raised bed. For deeper raised garden beds, just stack the corners and build right on top. Corners measure (L x W x H) 9.25" x 3.24" x 3.24". Made of Aluminum Alloy and weigh 1.01 lbs. 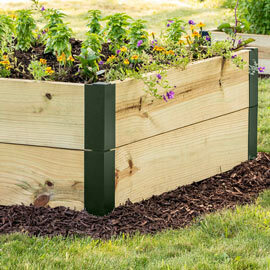 Please Note: Raised Garden Bed Corners accept a standard 2" board. (The true measurement of a 2" board is actually 1.5".) If you have wood specially cut for your raised bed, be certain it's cut to a 1.5" width. If you purchase off the shelf, it will be labeled as a 2" wide board but will be ready to go—no cutting required.